Guess what today's post is about? Let me save you the trouble....you're wrong. But, before we get started, It's Truthful Tuesday! Today, I reveal the truth about yesterdays post. It seems I have taught you all too well. As you all guessed, it was made up. But, I learned something. I learned that I threw in too many obvious errors. Harding wasn't running for president in 1880. (there wasn't an election in 1880). The amount of hush money was too high. Republicans and democrats have never got along. Well, I'm 0 for 1. Next Monday, I'll get you, though. Because, well, you'll see next Monday. As I was saying, you're wrong. Even though that picture is of a fossil, this post is not about a fossil. It's about the creature that made the fossil. Judging by the picture, you'd think the creature was some sort of shelled creature, like an Ammonite, or a shelled cephalopod. To put it into plain english, it was a cartilaginous fish. That is, fish with no bones. It lived from the Carboniferous to the Triassic periods. (310 - 250 million years ago). It survived the permian-triassic extinction event that killed off 90% of all sea creatures. So, what you're looking at is the teeth of todays creature. 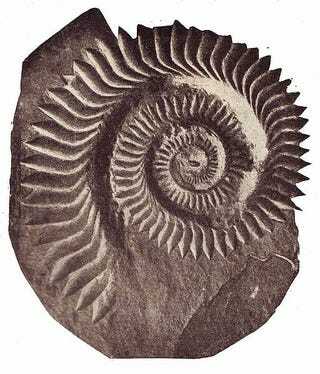 It was called a Helicoprion. And, yes, those are it's teeth. They sat on the lower jaw, and comprised all the teeth in the fishes mouth. When it closed it's jaw around it's prey, the lower jaw would travel backwards, with the spiral teeth slicing through the prey. It's actually really hard to come up with the words to describe this fish, so I'm just going to post a picture. This is the latest theory of what it actually looked like. However, there has been a lot of speculation as to what it actually looked like. Here is a picture of some of the various ways people have theorized how it looked. So, as you can see, this was one seriously odd fish. Just the kind of odd fish that fits perfectly in an oddities post. I hope you enjoyed this odd fish. I know I did. As noted earlier, the closest living relative to the Helicoprion is the Chimera. Not the mythological Greek Chimera, but the actual, real life Chimera. Naw, just kidding. I just wanted to post that pic. But the Chimera is an actual fish, and it's actually the descendant of the Helicoprion. Google will provide you with pictures if you're curious.